In the spirit of keeping it real, I’m here today to share our back deck and how I fixed a mistake I made a few years ago. First off let me say that sometimes you just have to take a leap of faith and try something new. If, by chance, it doesn’t work out so well, you also must admit you were wrong. Which is what I’m doing today…but let me start at the beginning. Here (below) is our deck in late May. Notice the light gray stain. Anyone who has a wood deck knows that the staining ritual needs to take place every few years. For us, it’s always a major ordeal. The last time we tackled it I decided I wanted a giant bang for my buck so I chose a completely different, and much lighter, stain color. Oh did I love it. My happiness soon wore off because although very pretty, the gray quickly got dirty and was hard to clean. My husband has spent the past three years saying I told you so…because he warned me but I didn’t listen. So after living with it a few years and trying my best to keep it clean, I admitted defeat and went back to a brown stain for the deck floor. It does show dirt but not nearly like the gray did…and most of the time I can tidy up with just a blower. After searching on Pinterest for deck colors, I decided to go with a white railing. This pin was my inspiration. I am, so far, very happy with my choice. Not only does it have an updated look, but the white railing lightens it up too. I also had a problem with rotted posts. At first I thought I would have to replace every post in the railing…or remove the railing altogether. After thinking about it a while, I realized I could just cut off the post tops and add a finial. I really wanted the post caps like in my inspiration picture, but I opted for the finials because they were so much cheaper. The caps were over $10 each and the finials were just over $2.00. I needed eleven so after I did the math, the finials won out. I think they give it a little classic charm and honestly, anything is better than the rotting posts I had before. So…at least for a few years my deck is squared away. On my never-ending wish list is a new deck made from composite decking. It’s not at the top of the list though so chances are it will never become a reality. I’ve said many times, that of all the things about our home that I love, my favorite thing is the back yard area. Keeping that in mind, I just might move that new deck up a rung or two on the wish list! Your deck is beautiful. I just moved from a home that had a composite deck. Although it was nearly maintenance free, it wasn’t completely so. Perhaps there are different types, but our posts and railings were plastic. There were several chipped places and it was easily stained by bird droppings. I didn’t think they were as pretty as wood. The decking itself had boards that had faded and were rougher than the others. I suppose there is no such thing as totally maintenance free, and there are always trade-offs when choosing materials. Thank you Rebecca! I honestly don’t think I would install composite decking now after reading all the comments on this post. I agree that bird droppings are very hard to get out and I also agree that there is no such thing as maintenance-free! Hi Ann! I don’t have a deck yet, it’s on my wish list, but your post reminded me of a visit to a friends a few weeks ago. She and her husband have expanded their deck and in doing so had to re-stain to try to make it all match. Anyway, the interesting thing to me was that they painted the railings black and stained the other parts a reddish brown. The effect was stunning, I thought the black parts were wrought iron until I touched them. My friend says that neighbors have stopped by and asked if they re-did their deck with iron. Its given the deck a Tuscany look, I think. I love your blog, your home is lovely! Your deck looks great! My deck floor is the same color as your current color. My thought for next season was to stain it gray so I read your post with great interest. Maybe I will just do the railings white and take it from there! I don’t have anyone to tell me I told so, so maybe your advice will prevent me from making a mistake!!! I love how the railings turned out and I like the finials far better than the caps. The finials look custom! Welcome to On Sutton Place Tammy! 6X10 deck area and 3 steps that leads to our screened in front porch. In the back we used pressure treated wood for our deck that is approximately 15X 20. My husband is quite disappointed in the way the composite out front has ‘weathered’ and is deciding if he should replace it with wood or try painting it. The wood deck in back did require re-staining every few years, but he almost didn’t mind doing that, because he sort of expected it. If anything, maybe use the ‘fake wood’ railing stuff to avoid having to point al those spindles! He hoped the composite would be ‘maintenance free’ which it has proven not to be. Since wood cost less to begin with, for us, maintenance requirements being somewhat equal, wood was a better budget choice for us. Thank you Joanne! Using the composite railing sounds like a great idea. I will definitely do some research if we ever decide to replace. You might think twice about the composite deck. We replaced our wooden deck with one a few years ago and have regretted it. I’m sure that brands perform differently but ours actually requires more maintance despite the sales pitch. Within a week the color was almost completely faded out, we don’t eat out there because if any thing spills on it it stains, if there are any leaves on it when it rains they stain it, mildew stains, boards warp, etc. I haven’t found any thing that completely cleans it. Looking forward to replacing it with wood if and when i can ever afford it. So much for the low maintance! Be sure to research the different brands before making this investment. I took the contractors suggestion and made a $7000.00 mistake. Oh my gosh Debi thank you so much for your honesty. I will definitely think twice if we ever replace. At this point maybe I’ll stick with what I have! I did the same thing as you last year and stained my deck color to gray. I love the color but it is doing all the things you talked about in your post and I am so frustrated with it!! I told my husband we will have to go back to a darker color very soon. So disappointed with the gray after all the hard work to get it to that color which I do love!! The never ending projects with owning a home…ha!! I thought the gray floor was pretty in the picture but from what you said, the wood stain sounded more practical and it is pretty too, so win-win. The fence looks great. 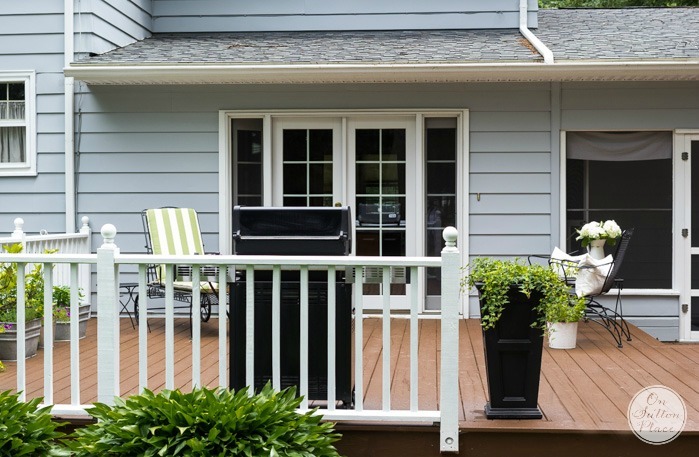 Backyards are dear to our heart so back deck may stay relatively high on the list. We also just stained our deck a dark brown. We had the whole decking replaced about 3 years ago and went with white trex railings. I also love the contrast and it looks good against our blue house. Yours looks more pulled together than mine though, with all the rain we’ve had I can’t have pillows! Love the changes you made to your deck! They are subtle but really pop, especially the finials… nice job! I think the brown on the deck makes it stand out! The light color just blended into the house color. The new finial are great! Love your finial solution, Ann! We stained our deck about 3 years ago, and although it has held up very well, it needs a little touching up. 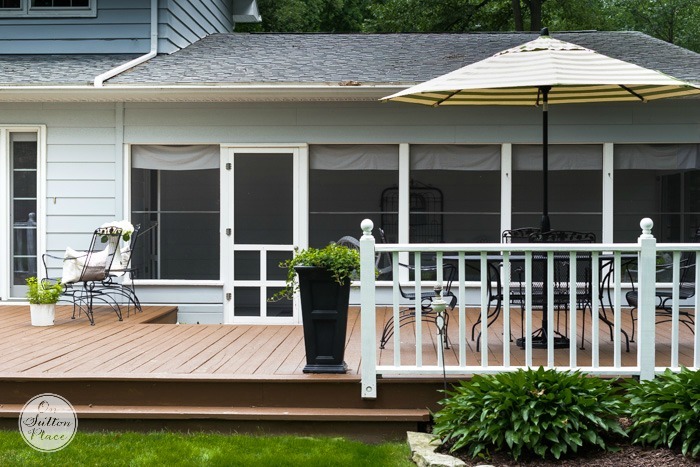 The dark brown color looks very handsome on your deck! I think your deck looks wonderful! I love your galvanized tubs! I love your new brown. It grounds your deck. We have a wrap around porch…the way we chose our stain color was to match the dirt color. We have had it for years…looks good & I sweep every now & then. 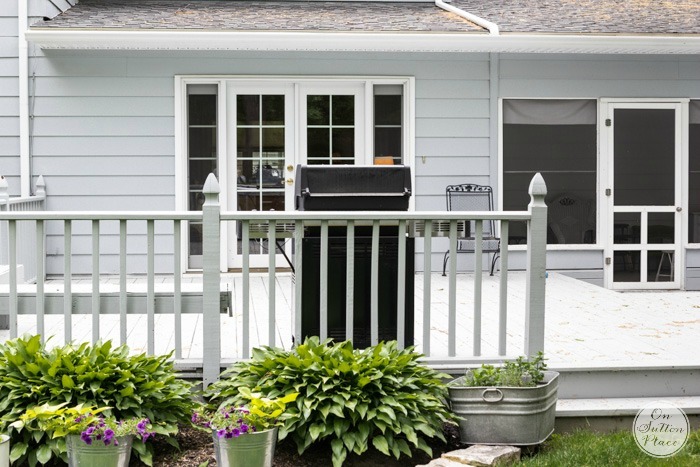 Your deck is a nice size and really looks like a great place to spend some time.Thanks for the info guess that took care of my decision i was trying to make about my deck floor. If it is any consolation to you, I very much prefer the looks of the finials over the caps. It gives the railing a much more gracious appearance. The stain is beautiful, as well, and probably does not reflect the heat into the house. You have inspired me to spend some elbow grease on the back patio. I don’t have a deck, but a nice railing around the patio with finials would really add to the appearance. Thanks for the inspiration. I think your deck is lovely, Ann—you had issues and you found solutions. Good for you! I can’t believe how much better the brown looks than the grey!!! Your decorating always looks great!!! Love your blog!!! WOW! 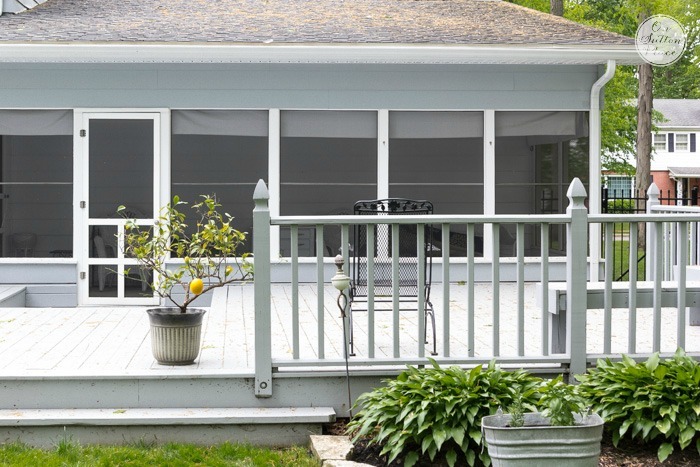 You have a great outdoor living space, plus a large screened porch. You are one lucky duck! Today’s post is so timely. My husband just handed me a brochure of deck stains and I was leaning toward a gray. What color did you finally select? I enjoy your varied range of topics. Thank you. The color is Pine Cone from Sherwin Williams. Good luck! How ironic…we just replaced a very worn out deck and my home is light gray. I love the white railings but I am struggling with what color to stain the floor later this fall after the wood has cured a bit. Your pictures are inspiring. I too thought composite was the way to go. My contractor advised me against it because the back of my home is totally south exposure. It gets very hot. Also when wet slippery. I have friends that either LOVE IT or HATE IT. I just didn’t want to risk the expense and not like it. You have a much much larger deck than I do and my wood replacement boards and railings cost $2,000. Can’t imagine what maintenance free would have been. If you really want to go that route…watch the Nov/Dec clearance sales at your local home improvement store. My friend was able to build a huge deck and fence for her multiple gardens at half the cost. As for keeping it stained and maintained…think about donating to a local Scout Troop, high school band, National Honor Society (HS), etc and have a mature group of young people come over stain. 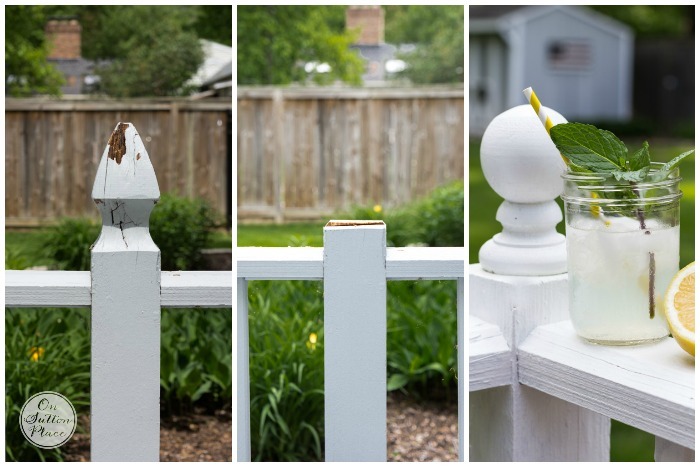 We did this several years ago after a storm went through and we had to replace our fence. I provided sub sandwiches, chips, pop, water and treats and we donated $ to their program. It was alllll done in one day. Many of those groups need service hours too so the donation doesn’t have to be crazy. Many were able to bring their own brushes. Silly me – I forgot to mention we hired someone to tear off and replace the deck boards and railing. What state do you live in Ann? I noticed the lemon tree sitting on the deck and I wondered where you lived to get that to grow. Hi Marsha! I am in Ohio. The lemon tree belongs to my husband and believe it or not, it’s about 40 years old. My husband got it on spring break when he was in college. He is now 62. :) We keep it inside over the winter but put it outside in the summer. It’s hanging in there! It looks beautiful! I loved the gray too, but honestly seeing this gorgeous pine cone stain, you chose well! The new stain gives it such a rich look. I like the new finials too! Great choices. May I ask where you purchased your galvanized containers? Did you line them with anything before planting? They look great! oops, I searched your blog and found your post about planting the herbs! Great information, and so informative. Thanks for the easy search button! Yay! I’m glad the search found what you were looking for. I love to hear that the blog is user friendly! Good morning Ann. We had Lowes construct our deck with their composite wood seven years ago. Yes, I chose gray for the floor, but we have a large outdoor rug under our table and chairs. 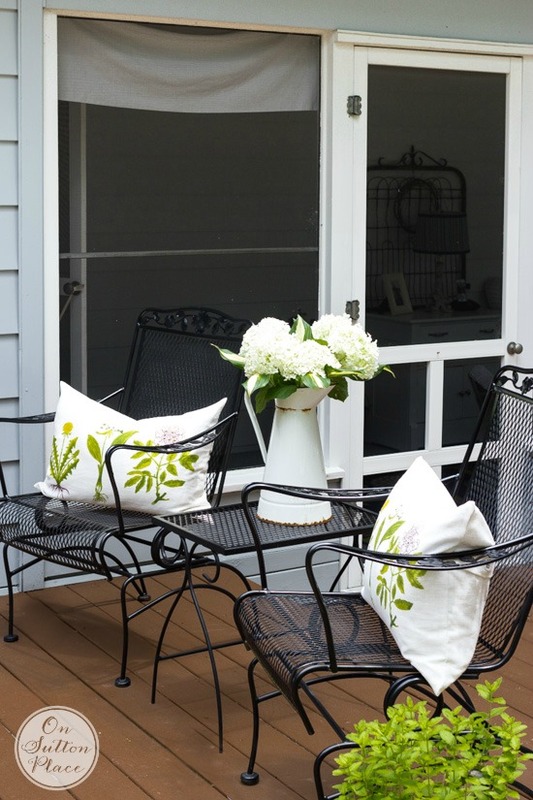 We have the exact rod iron outdoor chairs I see on your deck. So comfortable. 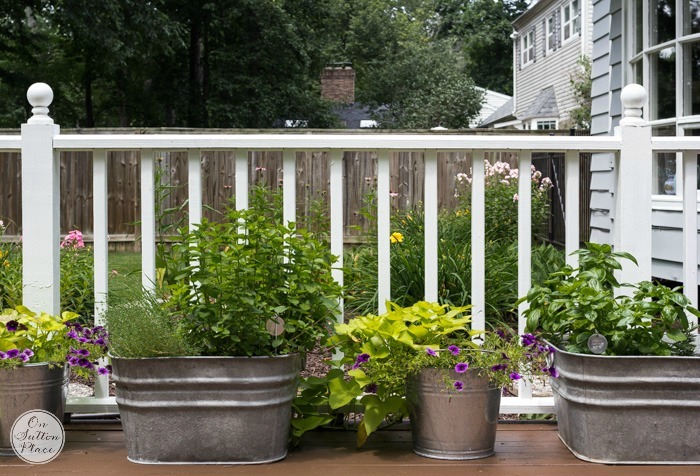 Your deck is lovely with those galvanized planters. Unfortunately, our deck faces west, and there isn’t one idea to fix the problem of hot sun from 2 in the afternoon till 7 in the evening. No, we won’t plant trees; neighbors have them and we would need a miracle to look outside one day and notice those trees had moved to the left six feet to bring on the shade. We do enjoy having our breakfast and lunches outdoors, and an evening sip of wine after 7p.m. Looks so fresh and inviting. We had the same problem with the deck stain. I choose a lighter color and every bit of dirt shows. Time to choose a darker shade. Just need it to be a little cooler so I can do the sanding and staining. I love the Mayne planters. I have had mine for almost 5 years. Still look great. I paid over a $100.00 a piece then. This year I found them for around $50.00 both the tall and cube style, now reduced to under $40.00.. The tall ones are lovely in the front courtyard and the squares cubes are perfect outside the garden gates and in front of the garage. I always enjoy reading your blog and getting inspiration. We have a friend we visit with a composite deck. It looks great and is low maintenance but it’s so hot that I can’ t walk across it with slippers on. It radiates the heat so we can’ t sit out there for long. Hi Ann, Your deck is very nice and the feel of real wood is so much nicer than composite decking. Thanks for sharing! I love your deck! It looks so peaceful and inviting. One question – how did you attach the finials to the posts? Thanks for all of your posts. I enjoy reading them. The finials actually have a big screw on the bottom. We just drilled a pilot hole in the cut off post and then screwed them in. It was very easy! Your deck looks great! We’re in process now trying to sand our deck (hoping it might last longer this way). Your deck is exactly what I’m wanting to do. Can you tell me the brand and color of the stain you used? Hi Kay! It’s Sherwin Williams in the color Pine Cone. OH I totally feel your pain!! We are trying to sell our home and we added a few deck platforms out from the original old deck. Our house is light gray like yours and we were looking at dark colors but our realtor suggested a gray similar to the home…gray is “in” right now. But. We. Have. A. Dog….. and you can see every pine needle and leaf. And red footprints everywhere…I think the dog somehow managed to put a dirty paw on every square inch. haha. Yes I know gray is very “in” and I honestly love it…but I hated the dirt more. :) Good luck with your move. Sounds exciting! Your deck looks amazing, Ann! You picked a winner! The pine cone color is a perfect contrast to the railings and the house color. I think I might just pop on over and sit awhile! Looks great, you might just want to stick with the wood deck. I have the composite deck and although it looks great, low maintenance and will probably last long after we have left this home it is almost not useable in the middle of a sunny afternoon because it heats up and radiates heat even if you are under an umbrella you can feel it. 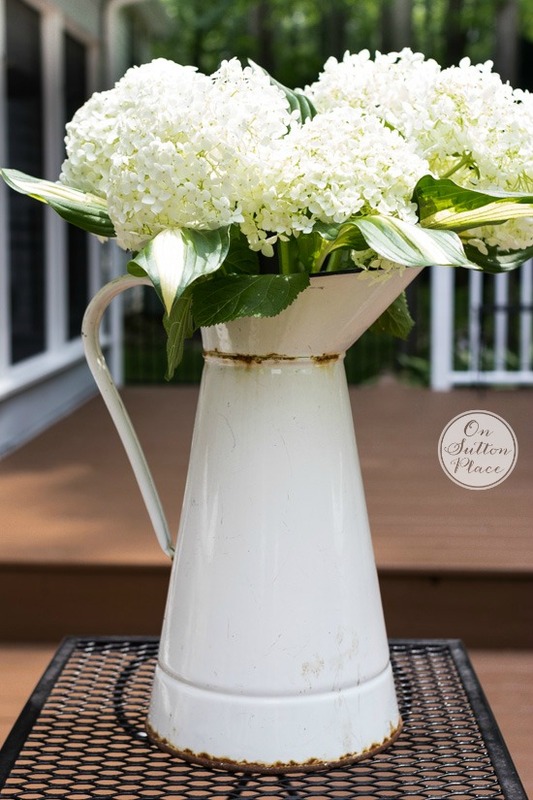 I think it looks lovely and I love the finials and white rail with the stain! Those galvanized buckets look awesome too! OMG! I did the same thing. Changed the deck from dark brown to grey to match the house. What a mistake. After just 2 years, it looks a mess. It has been power washed and still looks dirty and scratched. After seeing yours, we need to go back to brown, too. Love the white railings. Thanks for the incentive to tackle another project!